Life this past year has been anything but normal. 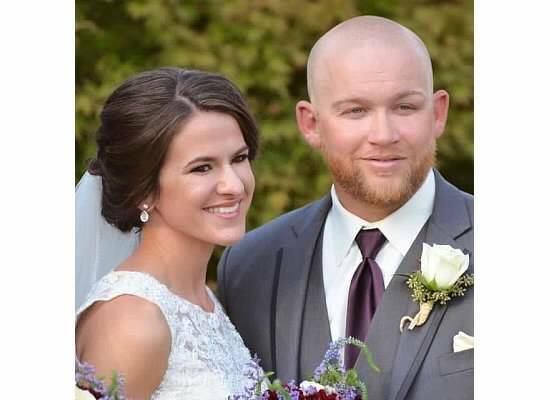 My daughter Julia was married on October 17th! To help plan her wedding, I put almost everything on hold which included hiking. However, I will cherish for a lifetime the memories I made with my daughter and extended family. If I remember correctly, my last hike was over two months ago. It was an early August morning and cool at the trailhead, 63 degrees. Eleanor joined me. I met Eleanor for the first time that morning when I picked her up from my neighbors’ home—her brother and sister-in-law. She was visiting from England where she resides in a village called Kinver. I was excited to be her Yosemite guide. Sentinel Dome, our first stop. The week prior when my neighbor requested that I take Eleanor hiking, I poured through my books to decide which would be the best trail. To make the most of our time in the park without a lot of travel and crowds, I chose the loop hike from Sentinel Dome to Taft Point. You may recall that I just did this hike with Andrew and Sarah. 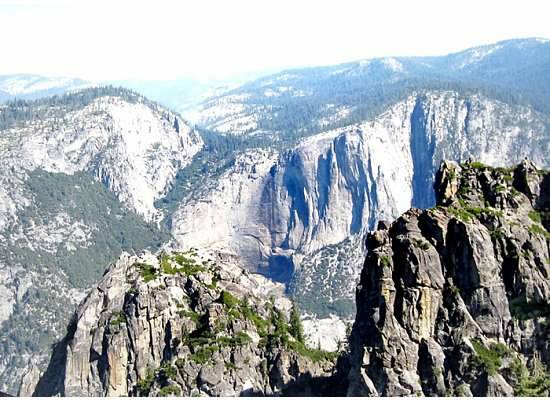 You can read about it by clicking here: Glacier Point hike: A Day of Views. 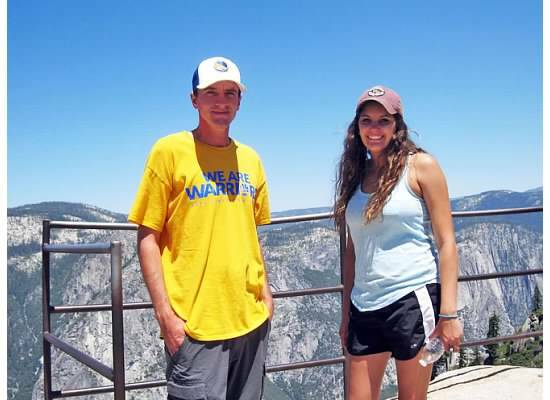 Andrew and Sarah at Taft Point, 7/28/2015. 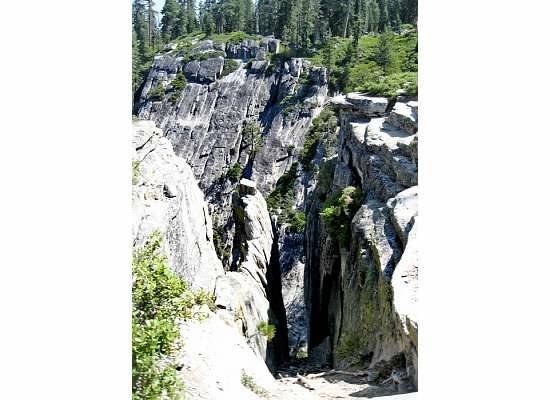 The hike itself follows a clear path, there are great views of Yosemite Valley plus interesting sights such as the fissures at Taft Point. Not knowing Eleanor, I hoped she would enjoy herself and come away with a love for one of America’s great national parks. 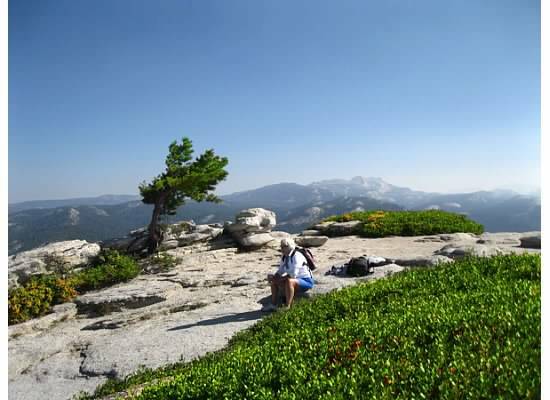 Eleanor on top of Sentinel Dome. Though a couple of decades older than me, Eleanor is an active woman who plays tennis, golf and bridge. She and I got along well. There was no awkwardness in getting to know each other. She kept up marvelously on the hike even though the elevation (8,000 feet) was much higher than she was used to. 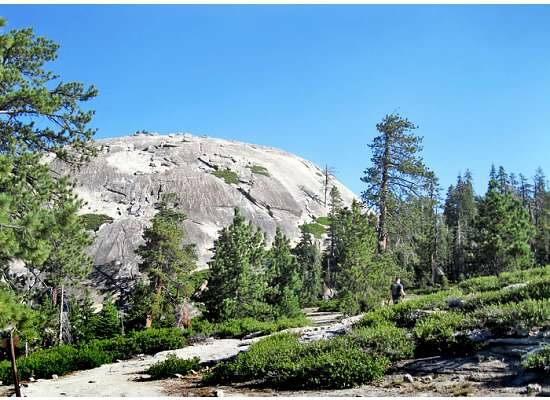 As we descended Sentinel Dome I watched her jump like a kid from rock to rock. It made me smile. 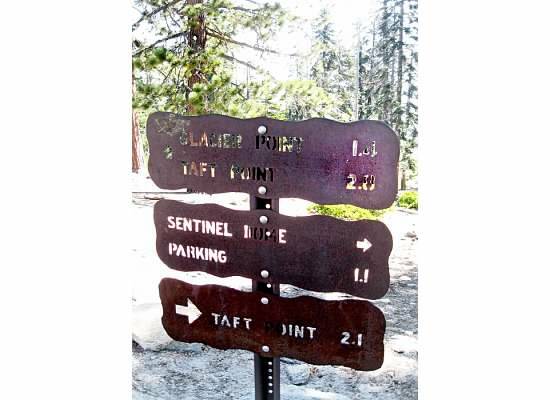 Trail marker leaving Sentinel Dome heading to Taft Point. We took the longer route, 2.8 miles. Though only fourteen days had passed since I was last on this trail, it was much different. Yosemite Falls dried up; smoke lay thick in the air above the falls from a camp fire gone astray; and Sentinel Creek that was a mud puddle then was baked dirt now. View from the top of Sentinel Dome of Yosemite Falls without water. Many of the wildflowers were withered, including the corn lilies that flourished only days prior. We encountered several deer on the trail, and as the day wore on, many hikers too. We spent little time at the fissures, but saw them all. Looking down one of the five fissures. By the time we reached the car it was lunchtime. We drove a mile down the road to Washburn Point (no photos), a picturesque place to eat our sack lunches. Perched on a wall we ate in silence admiring the vast view spread out before us. Regardless of how many times I return to this trail, I am amazed to experience something new each time. 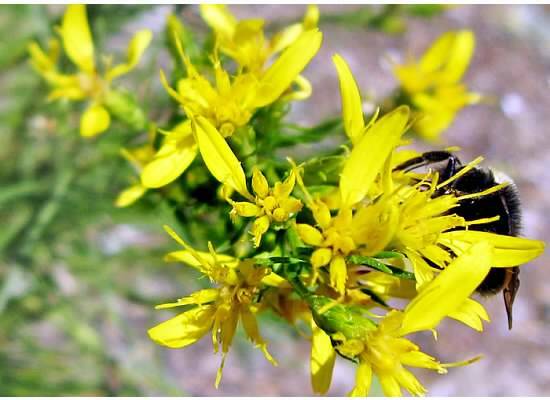 A bee in the blooms. This trip was especially enjoyable getting to know a new friend. Thank you Eleanor for the opportunity to show you around my favorite of all places, Yosemite National Park. 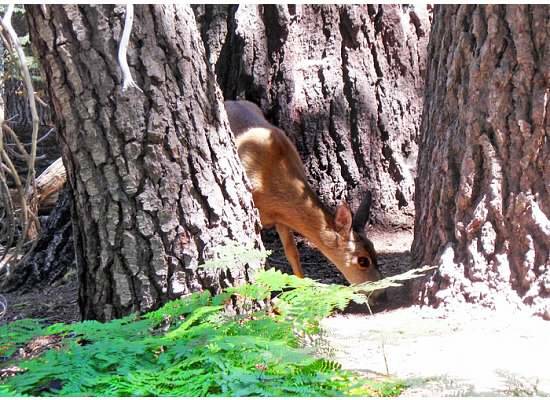 This entry was posted in Yosemite Hikes and tagged Day hike, Sentinel Dome, Yosemite, Yosemite National Park on October 29, 2015 by Janet. How fun seeing Yosemite through the eyes of someone who hasn’t been. What a fun day. Hoping Yosemite gets rain and more rain this year. But even still the photos are beautiful. Thanks, Terri. Hoping there is snow this year too for snowshoeing. Nice pictures, nice prose! Hopefully, when we come to visit next month we’ll get a chance to do a short hike! Love your blog! Thanks Dad. And if not a short hike, maybe a scenic drive. The wedding photo is lovely–and the pictures of Yosemite are wonderful. What a beautiful area! What a delightful trip–thanks for sharing. And I love the wedding photo marking the start of their new adventure together. Like hikes at Yosemite, it be a little different each day but always something wondrous to enjoy if you take the time to sit and enjoy. Happy Thanksgiving!